Experience the charm of coastal living when you spend a day exploring the picturesque neighborhoods, quiet beaches and lively local restaurants on St. Simons Island. Visitors will find no shortage of exciting island activities, from riding beach cruisers and exploring charming historic sites to dining on fresh seafood. Plan a perfect day with this itinerary highlighting some of the best places to go in St. Simons Island. Start your day at one of the most beloved little restaurants in St. Simons Island: Sandcastle Café, a quaint eatery serving up hearty brunch and breakfast dishes. Locals rave about the Glorious Breakfast Buffet, complete with southern favorites like grits and biscuits and gravy, an assortment of fresh sausage, crispy bacon and corned beef hash, eggs cooked fresh to order and more! Word on the street is that Sandcastle Café makes a killer mimosa to accompany that incredible breakfast buffet, as well. After breakfast, hop aboard a trolley for a Saint Simons Colonial Island Trolley Tour, as you get lost in the storied past of St. Simons Island, all told by a local himself. Relax in style and air-conditioned comfort as you are taken to see 86 points of interest throughout the island. The 1.5-hour guided tour departs at 10 a.m. and 12 p.m. Mondays through Saturdays and on Sundays at 10 a.m.
After the tour, get a closer look at some of St. Simons Island&apos;s historic landmarks. 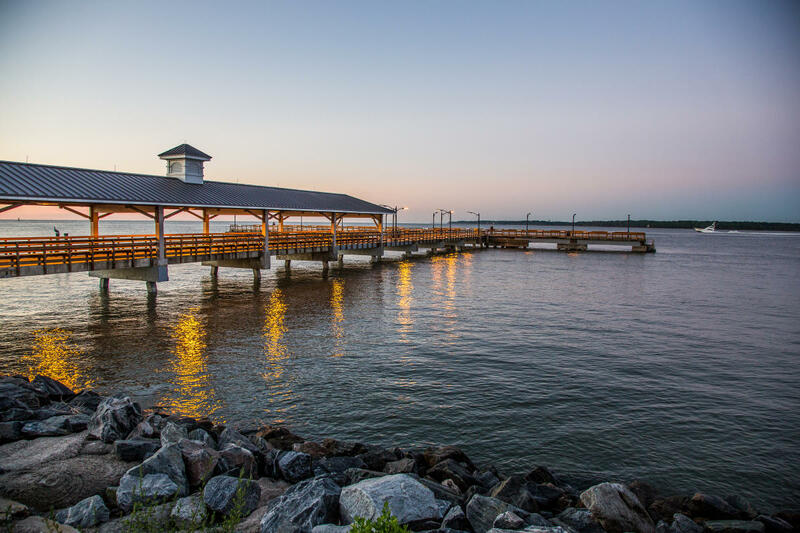 Enjoy a gentle stroll down the St. Simons Island Pier, where you can enjoy sweeping ocean views and watch anglers try their luck as they drop in a fishing line. Continue walking along the paved pathway through Neptune Park and along the waterfront to St. Simons Lighthouse Museum, where you can climb the lighthouse tower and explore the keeper’s dwelling, which houses museum exhibits and a gift shop. Bonus: Stop by the Golden Isles Welcome Center to find one of the elusive tree spirits, and pick up a map to help you find the others hidden throughout the island! Stroll the tree-lined streets of Redfern Village shopping district, where you can take your pick from a number of locally-owned boutiques and art galleries. Browse exquisite artwork at local galleries before picking up the perfect hostess gift from Two Friends. If you feel like you&apos;ve shopped &apos;til you dropped, head to Golden Isles Olive Oil for a light lunch and perfect wine pairing. After lunch, pair some sightseeing with a little bit of exercise when you rent a beach cruiser or tandem bike from a local shop, and explore the expansive St. Simons Island Trail System, featuring more than 30 miles of bike paths that pass by shopping districts, Sea Palms Golf Club and other Saint Simons attractions. Make the most of your evening at one of the numerous restaurants in St. Simons Island boasting dramatic views. Diners looking for an upscale dining experience can indulge in classic coastal cuisine, from scallops to blue crab, at ECHO: St. Simons Island’s only oceanfront restaurant. Here, the elegant dining room touts floor-to-ceiling windows with sweeping views of the ocean. For a breezy, laid back experience, enjoy outdoor dining and casual Southern cuisine with a family-friendly atmosphere (think lawn games and picnic tables) at Porch, one of the island&apos;s newest restaurants. Enjoy a laid back stroll around the Pier Village afterwards, and pick up a handmade dessert from St. Simons Sweets.